Brittany, Brittany……always coming up with such clever cakes. I love what she made here for her little niece. My oldest niece turned 15 a few weeks ago. My favorite time to decorate is for the people I love. I especially love to make birthday cakes for my nieces and nephews. I chatted with her mom (my sister-in-law) a while ago and she told me a music theme would be great. My niece plays the piano and loves music. Sounds right for turning 15, right? So, here is the cake I made for her. Do you want one of your own? It might not fit exactly what you need…..but the methods I used can be used for any cake theme you make. If you need help with stacking your cake, check this post. Or if you missed how to cover your cake, check this post. The first thing I did was to cover the cake board with fondant. Then I cut out her name and placed it down flat on the edge of the board with another color. Make sure you use a board big enough to allow room for the letter. My board with 5 inches bigger than the cake. Ex: My cake was 10 inches and the board was 15 inches. You are going to need two cake boards tapped together, fondant that matches the color scheme of your cake, and some buttercream. Spread some buttercream on the cake board. Roll out the fondant that will cover your board. Lay if over the board, fold it over the edges just a bit and cut off the extras. Usually I add ribbon around the edge of the board but this cake didn’t really need it. if you want to add ribbon for extra detail, attach it with a little bit of water. After your cake board is covered with fondant, move on to covering your bottom layer of cake with pink fondant. Normally (like shown here), I cover my cake with the fondant and smooth it to the cake and then cut the extra fondant off the bottom……….all while it’s right on the board. When I have a fondant covered cake board, I cover my bottom layer not on the cake board but just on a piece of foil. Then after the cake is covered I put some buttercream on the board, and lift the cake off the foil and onto the center of the board. Just makes it easier. Next, cut the name you need right out of the fondant on the cake board. Make sure the name is centered and at the front of your cake…….and then peel each letter out carefully. Roll out some white fondant about the same thickness of the fondant on your cake board. Then, cut the name out again in the white fondant and then fill in the spaces on the cake board. All flush and smooth with the board. I have shown how to put stars on sticks back in this post. These are very similar. But I wanted my numbers to have 2 colors. I colored gumpaste the same pink and black as the fondant on the cake. Then I cut the number ’15’ out in pink and set it aside to dry. Then I cut out ’15’ in black. But then I used my rolling pin and I flattened the numbers out a little thinner, to make the black numbers bigger than the pink ones. Next, I placed the pink on the black by attaching them with water. Then I set the numbers aside to dry over night. The next day, I attached sucker sticks on the back of the numbers with melted chocolate and let the chocolate harden. Cut out strips in a rectangle shape, all the same size. I had my keys go 3/4 of the way up the cake and used a bit of water to get the keys to stick. I used a strip cutter to make the work go a little faster. You could easily use a ruler and pizza cutter too. Make keys all the way around the cake. Start working in the front and go to the back from both sides. Have the seam meet in the back. After the white keys, move onto the black ones. I cut them 1/2 the size of the white ones and placed them in between the keys. The pattern is two black keys, space, three black keys, space, two black keys, space,…..etc. I covered the smaller cakes with white fondant and placed it on top of my pink cake. I colored some buttercream black and put it in a piping bag, with a #3 tip. I practiced piping notes on a plate until I was comfortable with making music notes. Then I piped some right on the cake. If you make a mistake (I did…a few times) just wipe the buttercream off carefully with a damp paper towel, let the fondant dry, and pipe again. I added pink dots for extra detail and to tie the 2 colors together. Then, I inserted the numbers with the sucker sticks right into the middle of the top layer. If you have extra cornstarch on the cake, now is the time to clean it up with a damp paper towel or a paintbrush and water. Now, off to the party. Here I am with my niece. Isn’t she the cutest?! Each cake is so personal and unique. No two are the same. Maybe you want to add a covered cake board to your next cake………or maybe even piped music notes. I hope these ideas will help with a creation of your own. Such a cute cake! You are so talented with that fondant! This is adorable. My daughter is a huge music/piano fan, this would be perfect for her. Thanks for all of the tips. I'll be referring back to this on her birthday! I love it, i love fondant! And what a great explanation, thanks. I get so excited when i see make a cake series! you are extremely talented! this is by far my favourite blog. thanks for always sharing such creative ideas with us. So cute!! I love Make a Cake Series!!! I have tried some things and have enjoyed the outcome. Just one question. Where do you get cake boards? gilchrist- I buy my cake boards at Micheal's. You can also get them at walmart, joann fabrics, or online. I hope that helps! I am so curious, what kind of fondant do you use? I have used wilton and I don't think it's that easy to work with, so I'm looking for other options. Brittany I am so amazed. What a beautiful and special cake!! You are extremely talented! Beautiful ideas! I love the name on the board in fondant! So simple yet so sophisticated. I'll have to give that a try soon. Blessings! Your cakes is really wonderful! Love your blog, keep up the good work! Julie- My heart just broke when I read you had a hard time. I have been there and I know that frustration. It stinks! I make Wilton buttercream and at the end add coco powder. I add about a 1/2 cup ish. I just add a little and taste then repeat until I like it. If it gets stiff I add more milk. I hope that helps. That music cake took about 10 hours. Including the baking, making fondant, everything. I hope you have better success. Good luck. thats really pretty, i knew you had a talent for sewing! (i mean who doesnt!!) but not for cake making! :) i want to ask how you get your amazing ideas! Thank you so much for this piano keys cake idea! You did a wonderful job. This is a great looking cake! What size is the bottom layer? Have you ever covered one in butter cream and then topped with the piano keys? Beautiful cake! Thank you for the idea. 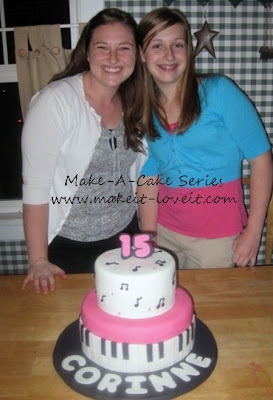 I am going to make this for my daughter’s 16th and add drama masks to the top layer! She is going to love it! Thanks for all the tips! So you use corn starch to keep fondant from sticking on counters etc? I haven’t had good luck with flour or powdered sugar or even butter/Crisco. I am off to read some more of your blog posts for more details about that. Maybe my problem is I make MM Fondant, and I might need to get it a little more dry.. not sure.